While it seems most of Latin America seems to run on over-drive, making sure the world realizes they’re open for business, Uruguay is, as always, content to sip her maté from the sidelines. Uruguay is an ideal choice if you’re considering a move with children. What’s more, Uruguay boasts one of the world’s most affordable in-country options for medical care if you’re a resident. For around US$50 a month, you can obtain hospital-based health coverage through two different programs, both of which cover in-patient care, emergencies, surgeries, even at-home after-care. Uruguay is also one of the easiest places in the world to obtain a foreign residency visa. You can qualify with an income of just US$500 a month from a source outside the country. The figure is dropped to US$200 a month if your income is generated from within Uruguay. Uruguay takes a zero-tolerance stance on crime, and Uruguayans are friendly, welcoming people who watch out for their neighbors, fellow Uruguayans and foreigners alike. It’s increasingly difficult to open a bank account as a foreigner in most countries around the world; Uruguay is an exception. In fact, in Uruguay, you can open an account at the government’s official bank just by showing your passport. The bank likely won’t even ask for references. It’s not only easy but convenient, at least for banking needs within the country. Most everyone has an account at the government bank, and inter-account transfers are easy via the bank’s website. You can hold U.S. dollars, euro, or Uruguayan pesos and move money among the currencies online. It’s also possible, sometimes, as a foreigner, to open an account at a private bank, but the requirements are stricter, and it’s really at the discretion of the manager. If you’re an American, you may be turned down by a bank that doesn’t want to be hassled by the IRS, and an American will not be able to open an account in this country at an American bank, such as Citibank. Impossible. Regardless which bank you choose, your account information is confidential, even from Uruguayan government agencies. The downsides? Retired way down south to not-so-accessible Uruguay, you might not get back home to North America to visit your grandchildren as often as you’d like. And, frankly, you might get bored. When you begin focusing on this retire overseas idea, you realize quickly that you aren’t going to retire to Uruguay…or to any other country, for that matter. You’re going to retire to a neighborhood or a community or a region or a seaside town in Uruguay or wherever. You can’t think about retiring to Uruguay anymore than you could think about retiring in the United States. Where should you focus your search? We recommend La Barra, which offers the most sophisticated seaside retirement option in Uruguay…and one of the most appealing coastal retirement choices in the world. La Barra is a town with beautiful beaches, great restaurants, quiet wooded neighborhoods, and more nightlife than you would imagine for a place this size. For some reason, seaside La Barra has been overshadowed by its more famous neighbors (Punta del Este, for example, farther east along the coast), yet it has everything you could want in a retirement destination. Maybe the best of everything. There are plenty of small beach towns along Uruguay’s coast, but La Barra is special. It is a small, “walkable” town, yet it offers all the luxuries, services, comforts, and conveniences you could want. Furthermore, La Barra is clean, well-maintained, and safe. And, like all Uruguay, it enjoys First World infrastructure with good public facilities, drinkable water, and well-maintained beaches. Houses in La Barra sell for between US$50,000 and US$150,000. Expect to pay between US$500 and US$700 a month to rent a comfortable home here. 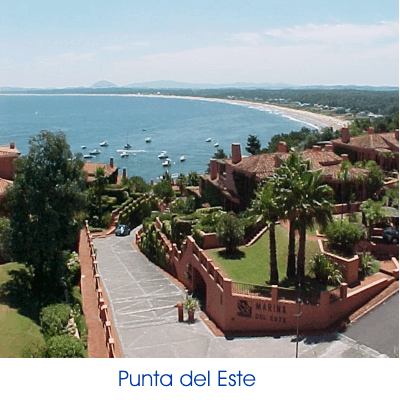 Punta del Este is another expat friendly option in Uruguay. Known as the St. Tropez of Uruguay, this area boasts miles of beautiful pristine beaches and luxury hotels and resorts, and, because it’s the summer destination for wealthy South Americans, amenities and services are top-notch.